Life insurance is now more affordable than ever for people over 70, according to the results of a survey regarding the costs of new policies. The price of a new term life insurance policy for seniors has dropped considerably in recent years, allowing even people over 70 years old to obtain affordable term life insurance coverage. Life insurance was not historically affordable for senior citizens, except for very small “burial policies” meant to pay just enough to cover funeral expenses. These so called “burial policies” can be very expensive, and have relatively small death benefits. In fact, they often end up costing owners more money in premiums than they pay out in death benefit, which is not a very good deal at all! In the past if senior citizens did not already own life insurance by the time they were 70 years old, chances were that they would not be able to afford to purchase a new policy. This has changed. Life insurance is now very affordable for people in their 70’s. 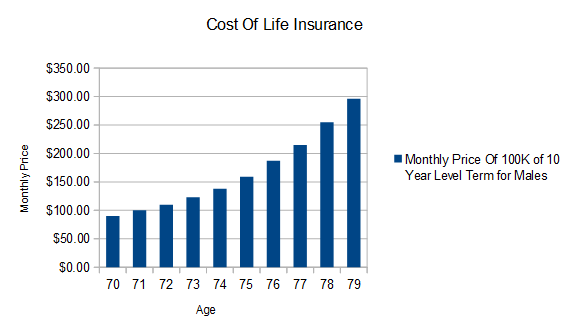 This graph shows the monthly premium cost of a new 10 year level term life insurance policy for people aged 70 to age 79. The graph illustrates the monthly price of a 10 year level term life insurance policy for a healthy male (males are generally more expensive to insurance than females). The data is taken from a recent survey of prices from various major life insurance companies as of 2014, taken from a public quoting source. The monthly cost for a healthy 70 year old male is less than $100 a month for $100,000 of death benefit, which is affordable even on a fixed income. The price does start rising more rapidly around age 75, but even at age 79 a policy is less than $300 a month. According to US Census Data, senior citizens earn a median of about $35,000 a year nationwide, from all income sources. At $100 per month of premium payments, that makes cost of life insurance is less than 4% of their earnings. This is certainly a price level most people would consider “affordable”, especially given the potential value of the coverage to their beneficiaries. The biggest reason that prices are so affordable is that the life expectancy has increased in the United States. The average life expectancy in the US has risen from under 70 years in 1960 to nearly 80 by 2012. According to world bank data higher income earners also tend to live even longer than this average. Because the price of life insurance is based in large part upon the mortality risk of the insured person, higher life expectancy correlates with lower costs of insurance. Life insurance companies seem to be conservative when reducing the cost of insurance in response to rising life expectancy, so premium prices for older people are slow to drop. The good news is that prices have now fallen into a range that even most seniors may consider affordable given the death benefit. The life expectancy has risen considerably during the last decade. 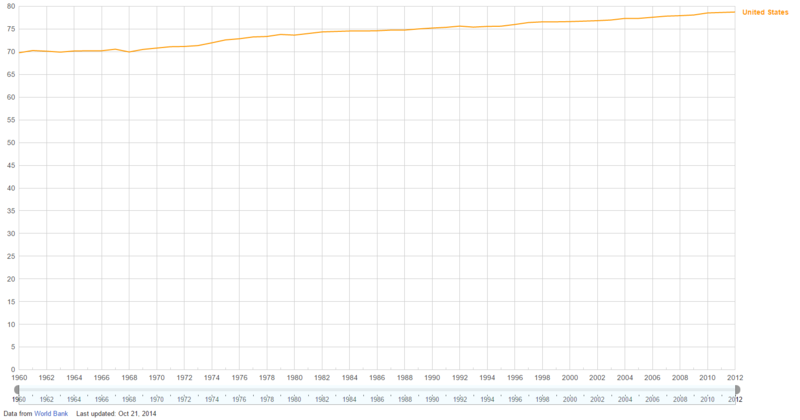 Here is a graph showing the life expectancy of US citizens since 1960 from World Bank data. Seniors need life insurance coverage for a variety of reasons. Given today’s economy, with pensions shrinking and seniors expecting to live longer, many people over 70 have either returned to the workforce or not retired at younger ages. Some people at this age may still have spouses or families to support, and they may need life insurance coverage to protect their family from the potential loss of income in the case of death. Simply put, even people over 70 may need life insurance protection to provide for their families in case they pass away unexpectedly. Other seniors may have enough money to survive on for their lifetime, but they may want to provide something extra for their children after they pass. If someone wants to leave a legacy or nest egg for their heirs, life insurance is an excellent option. Today it is even an affordable option to consider purchasing a new insurance policy for people already in their 60’s or 70’s. Another common reason for seniors to purchase a life insurance policy is for estate purposes. If they need to make an inheritance equal for all heirs (like when a single non-liquid asset such as a house is being passed on) , life insurance can provide the flexibility of cash. Life insurance can also pay taxes on items being passed on, such as estate taxes or the taxes incurred by the inheritance such as property taxes. Regardless of the reason that a senior needs life insurance, the good news is that affordable term life insurance options exist. Even if someone is over 70, chances are an affordable policy can be purchased.